The island of a thousand flavors! Hmmmm you know by now that I am very attracted to the islands but when they have at least 196 flavors or even more, I don’t ask myself too many questions! Today, we are off to Barbados, an island where the culinary influence is European, African, and Asian. 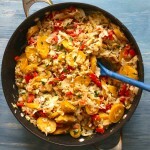 As I explained when I cooked blaff cod from Saint Vincent and the Grenadines or saltfish buljolde from Antigua and Barbuda, it is very rare to find a recipe unique to each Caribbean island. They often share the same dishes with sometimes just different names. 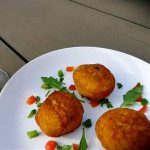 Although Barbados features these salt fish cakes as their specialty, I hardly see any difference with the recipe of the famous accras (salt cod fritters) from the Antilles, with the difference that the version from Barbados includes baking powder in the batter. 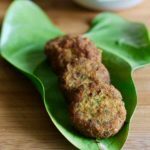 These famous little fish cakes are really a specialty from the 4 corners of the Earth. 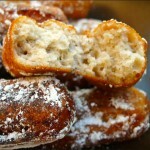 In Spain and South America, the famous buñuelos are made with whitefish. 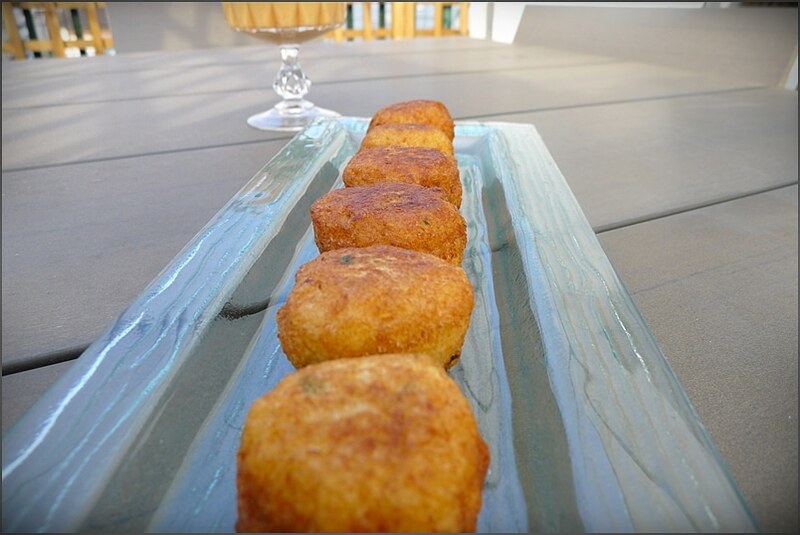 In Portugal, bolinhos de bacalhau are similar in all respects to Barbadian salt fish cakes. Everyone knows about Asian tempuras! 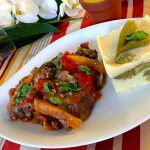 In Africa, the stuffing is often wrapped with dough like in the pastels from Cape Verde that I posted a few weeks ago. Of course, depending on the country, the spices and the type of flour will be different. Marie Rose sauce, mainly composed of mayonnaise is served with those fritters. Why Marie Rose? One story says that the sauce was created by a Captain of the English Navy during a dive of a shipwreck called the Marie Rose. As they had no sauce to eat the shrimp with, he made a sauce with all the ingredients he had on hand. 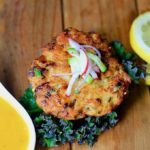 This sauce can be made very quickly and without any unusual ingredient. It is therefore probably not fancy enough for Mike! 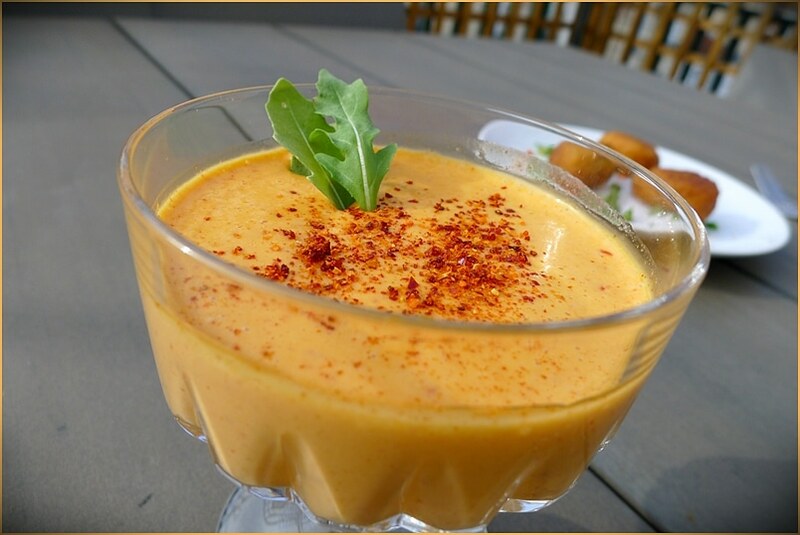 This sauce is similar to the famous cocktail sauce, Thousand Island Dressing or the Russian dressing which, despite its name is also the invention of an American who created it primarily to accompany his Russian caviar. At home, everyone loved this appetizer, including my youngest son Ruben, the most reluctant to new tastes. Make him eat cod was a challenge in itself! Very special thanks to my eldest son, Alexandre, who in the middle of studying for his Baccalaureat, stopped for a moment of relaxation and accompanied me throughout the preparation of this recipe. His opinion: delicious! His recommendation: enjoy very hot! 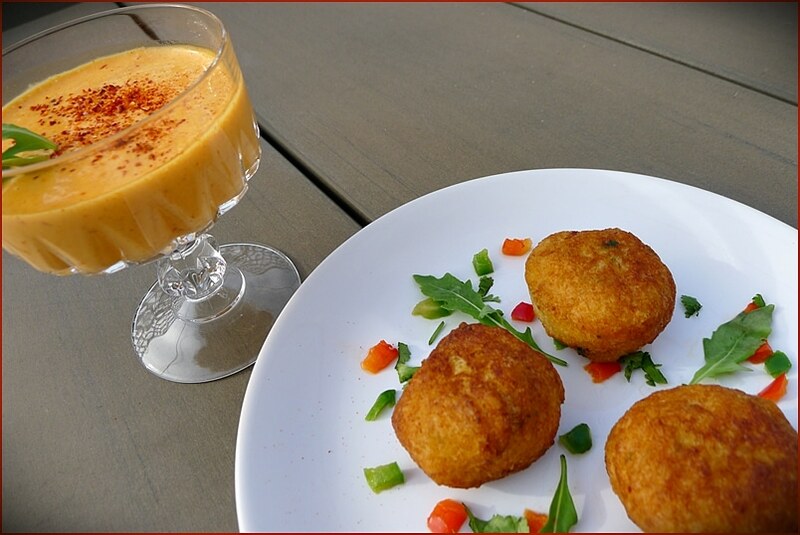 Salt fish cakes, a specialty of Barbados, are made with salted cod and are common in several countries under different names. Cut salted cod into blocks and put them in a colander. Immerse the colander into a large container filled with water. Desalt for 24 hours, changing the water as often as possible. Place the cod in a blender with the onion, garlic, shallot, hot pepper, and parsley. Pour the mixture into the food processor bowl. While mixing at low speed, add the flour, then the eggs one by one and finally add the milk slowly. Mix well. Make dumplings with well greased hands. Deep fry the fish balls in a large oil bath until they are golden brown. Place on dish lined with paper towel. Mix the mayonnaise and ketchup. Add Worcestershire sauce, Tabasco and Cognac. Mix well. 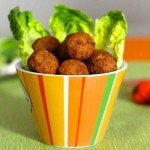 This looks like a very elegant appetizer i am making this coming weekend. Yummy!